Officially christened as the most decorated Olympian of all-time, Michael Phelps celebrates his record-breaking achievement by playing Words With Friends. It’s true. The 19 medal swimming sensation is a gamer at heart, who enjoys playing all different types of video games, but one of his favorites is Zynga’s Words With Friends. He has gone on record as saying that he will have up to 30 games going simultaneously. When the athlete is not training for competition, he passes a lot of downtime by taking to the iPad or phone. Between the Words With Friends marathon and up to 30 hours of Activision games, Mr. Phelps definitely has a full plate in front of him. The rigors of practice, working out, cardio training and proper nutrition do not leave many opportunities to partake in extracurricular activities. While traveling to competitions or being holed up in hotel rooms before events, Phelps can be found getting beaten regularly by younger gamers, under the cloak of screen names. It probably comes as no surprise that during the opening ceremonies, Phelps opted to stay in the Olympic Village and rest up for early morning competitions the next day. In order to unwind, Phelps delved into his preferred method of gameplay, the short, turn-based games, such as Words With Friends. Now that the swimming portion of the Olympics is over and Michael has achieved the record number of hardware, he gets a week to see other Olympic events, play more games and who knows? He might even have enough free time to check out Words With Friends Cheat for ways to beat the younger whipper snappers? While his gaming time will be more limited during his Olympic run – he even chose to bypass the Opening Ceremonies to prepare for an early competition – gaming is as much part of his persona as swimming. 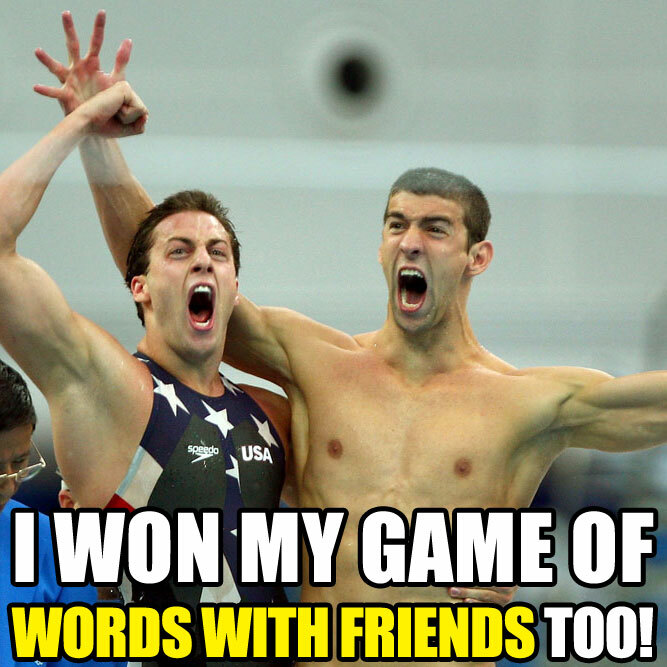 Given its short, turn-based gameplay, it’s likely Phelps will still be able to play some Words With Friends in London. And maybe the next time you make a kill in Call of Duty in the coming months, you might have just beaten the all-time Olympic medal holder.